Nine years ago when I first visited Austria for Christmas, a 20 year old -naive- me learned about the very cool traditions the Austrian people celebrate at Christmas. There are carolers in full costume and with instruments on Christmas morning, real candles lit on the Christmas trees, and since it is a heavily catholic country, most people go to mass on the night of the 24th... a perfect time for Santa -or Christkind- to come leave the gifts under the tree. Yes, he comes on Christmas Eve, not Christmas Day. During the holidays there is an abundant amount of Schnapps being consumed and tall steins of beer being poured, which makes for a very cheery bunch of people to celebrate Christmas with. Oh, and the Weihnachtsmarkts -Christmas Markets- are some of the best in Europe. Now, this is a very old tradition to keep kids in line, think old school Elf on a Shelf, only even as an adult, seeing Krampus running through the streets with his whip is a bit un-nerving. Thank goodness this would never be allowed to take place in the states. 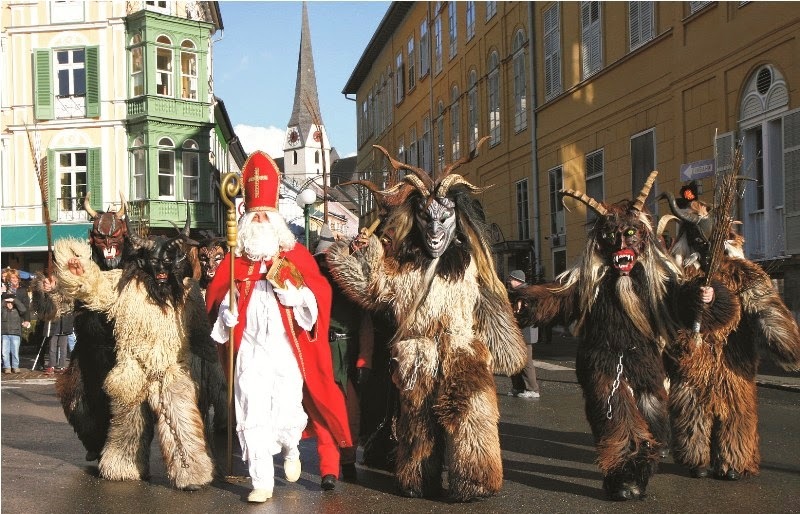 There are often parades that take place on the 6th that center around Krampus and his naughty ways. Here is a funny clip of Austrian actor, Christoph Waltz, explaining Krampus to Jimmy Fallon last week. Now, if you're ever in Austria, Switzerland or parts of Germany on December 6th, you've been warned.